Hi all, we are here to keep you updated about the latest features and changes on Facebook. Your support motivated us to post on some excellent and user-friendly features like Facebook Authorship and Facebook Audience Insights. It is true that it is not easy to keep track with all the new and useful changes taking place in this world’s largest networking site. This is why with a view to keep you informed, we are revisiting some of the best news about Facebook changes introduced by Facebook recently. Have a look at the post to find whether you have missed out anything. When talking about recent Facebook changes, you might have noticed that the Facebook News Feed can get you enthusiastic at times. You might have experienced missing out some important posts from people, whom you wish to keep in touch. But, to avoid this from happening anymore, Facebook has finally introduced News Feed Preferences. This feature helps you prioritize the items that you wish to see in the news feed. With Facebook News Feed feature, you can prioritize your friends such that the people, whom you care about will show up first. All you have to do is to just tap to star your preferences and Facebook will take care of the rest. If you want to continue as friends with some people, but do not want to see their posts in your timeline, all that you will have to do is to unfollow the acquaintances in bulk. This is one of the best methods you can follow to clean up your news feed. Just incase, you have mistakenly opted to unfollow some people, you can just reconnect with them. Many people in Facebook are concerned about ‘what will happen to my Facebook account after my death?’ But, to handle his/her account after the death of an individual, the account can be added to Legacy Contact. The graph given above clearly shows that the number of accounts deleted after the death is higher. But, only a few people have opted for the new feature called ‘legacy contact‘. This is something like writing a will for your belongings before your death. Yes, Facebook allows users to give control of their account to someone else to manage. How to add on legacy contact? The person, whom you have selected can just talk as himself/herself from your account and not as you. He/she will be allowed to write a post, change cover photos, change profile and can also respond to the requests of your friends. If you are not interested in this concept, you can very well choose to delete your account after death. This new Facebook policy change can be enabled right away, as it will be highly tedious for your loved ones to handle your account after your death. 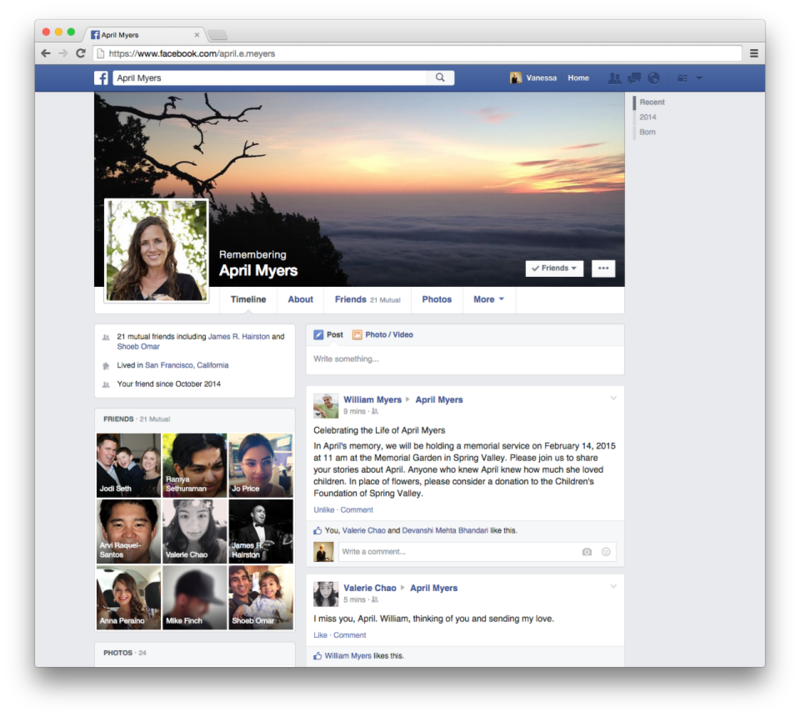 Facebook also redesigned memorialized profiles to pay tribute to the deceased by adding “Remembering” above their name and legacy contact can also pin a post to the top of their timeline. *Legacy contact feature is only available for US users as of now and as mentioned earlier it’s completely optional. Have you heard about the feature called ‘on this day‘. This is a feature that enables you to create a digital history about yourself. With this day, you can just get into your Facebook day to see what happened on a particular day in your life. This can be done by just visiting Facebook.com/OnThisDay. But, to use this feature, you will have to make some modifications. Yes, you will have to switch on the notifications for ‘on this day’. When you switch on the notifications, whenever there are some important events in your life, it will either show up on your News feed or Facebook will keep you informed about the same. Another cool feature is that just like any other Facebook posts, you can share that memory with your friends. Worth news about Facebook changes, isn’t? If you are on Facebook, you cannot control photos of kids posted by their proud parent. But, most of the parents wish to protect the online persona of their kid and they wish to make sure that all the pictures are in a single place and they should not allow access to the photos to everyone on Facebook. If you are concerned about handling the pictures of your kid, the best thing you can do is to keep yourself informed about the Facebook’s New Scrapbook feature. You and your spouse can together set up a digital scrapbook by visiting Family and relationships tab and then by clicking on the create a scrapbook. Only you and your spouse can control the scrapbook and you both alone can tag the kid in a photo. Just select a tag of your child and any photo that yourself or your partner wants to upload can use the tag for automatically adding it to the scrapbook. Even, both of you can customize the privacy settings for each of the photo. This is one of the many new Facebook feature that will help parents to create memories for the future for their growing kid. This is the wonderful feature for parents to take amazing photos of their kid and they can safely share the photos. If you are considering any other new Changes on Facebook are missed out on this post that you feel important, just share with us. Does any other feature has impressed you?